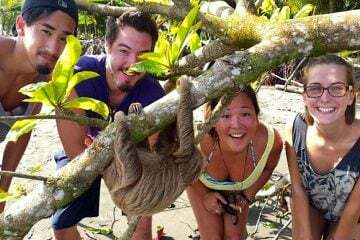 Costa Rica is one of the most wonderful and exciting places to volunteer. The people here are very friendly and accommodating to the extent where one may want to remains in this country. It has many features that attract several volunteers. However, this desirable factor is linked to a huge problem. There are many harmless sea turtles on the Costa Rica beaches than any other place. These animals are a big source of attraction to tourists and even the locals who view them as part of their culture. Tourism is a major source of income in Costa Rica, which makes it a challenge and for that reason, saving these sea turtles is a major crisis in the country. This is the driving force of many volunteers that visit the country and see how much these creatures need them. They have firsthand experience on the effects of harming the turtles, because the turtles are still becoming extinct; in spite of, being protected by the government. Many volunteers decide to dedicate their lives towards protecting Sea Turtles. The Sea Turtle conservation in Costa Rica was designed by A Broader View to give the volunteers a practical experience, where they get to participate in conservation processes, personally and practically. This involves activities; such as, working during odd hours; sometimes even late at night because turtle nesting occurs at night. This allows them to protect the endangered creatures from many poachers and predators in the area. Even the erosion of the beach contributes to extinction of these species and volunteers normally tackle that factor. The sea turtle conservation is an attractive project that invites all people, regardless of their specialty areas and past experiences in dealing with wildlife. Through this experience, one gets to protect and conserve a part of their nature, which are all beautiful and interesting creations. Volunteers are also at an advantage here as they receive the opportunity to interact with these turtles and gain experience in handling them. The experience enables volunteers to feel a sense of kindness and compasión. This is a wonderful experience that involves activities; such as, patrolling the beach at night, digging up nests, transferring eggs into the hatchery, dropping the young turtles in the sea at night, collecting research information and monitoring the artificial hatchery. One needs to have some form of knowledge in Spanish and above 18 years of age. Those who do not speak Spanish can register for language classes during their stay or allow for the natives to teach the language. It is truly an experience that is worth having, even if it is for a short period of time.